Reprinted from The Marketplace of Ideas by Louis Menand. Copyright © 2009 by Louis Menand. With the permission of the publisher, W.W. Norton & Company, Inc. This material may not be reproduced, rewritten, or redistributed without the prior written permission of the publisher. Bass professor of English Louis Menand is a literary critic and intellectual and cultural historian—author of the Pulitzer Prize-winning The Metaphysical Club and a regular contributor to the New Yorker. He is also a scholar of his discipline (he co-edited the modernism volume in the Cambridge History of Literary Criticism) and of the very notion of the academy itself (Menand edited The Future of Academic Freedom, 1997). His new book, The Marketplace of Ideas, to be published in December by W.W. Norton, is informed in part by his recent service as faculty co-leader in the development of Harvard College’s new General Education curriculum, introduced this fall (the book is dedicated to his colleagues in that protracted task). Weirdly, the less social authority a profession enjoys, the more restrictive the barriers to entry and the more rigid the process of producing new producers tend to become. You can become a lawyer in three years, an M.D. in four years, and an M.D.-Ph.D. in six years, but the median time to a doctoral degree in the humanities disciplines is nine years. And the more self-limiting the profession, the harder it is to acquire the credential and enter into practice, and the tighter the identification between the individual practitioner and the discipline. Disciplines are self-regulating in this way for good academic freedom reasons. The system of credentialing and specialization maintains quality and protects people within the field from being interfered with by external forces. The system has enormous benefits, but only for the professionals. The weakest professional, because he or she is backed by the collective authority of the group, has an almost unassailable advantage over the strongest non-professional (the so-called independent scholar) operating alone, since the non-professional must build a reputation by his or her own toil, while the professional’s credibility is given by the institution. That is one of the reasons that people are willing to pay the enormous price in time and income forgone it takes to get the degree: the credential gives them access to the resources of scholarship and to the networks of scholars that circulate their work around the world. The non-academic writer or scholar is largely deprived of those things. This double motive—ensuring quality by restricting access—is reflected in the argument all professions offer as their justification: in order to serve the needs of others properly, professions must be accountable only to themselves. A national conversation about the condition and future of the Ph.D. has been going on for about 10 years. The conversation has been greatly helped by two major studies: “Re-envisioning the Ph.D.,” which was conducted by researchers at the University of Washington, and “Ph.D.s—Ten Years Later,” which was carried out at Berkeley. Both studies identified roughly the same areas where the investigators thought that reform is desirable in doctoral education. These are: interdisciplinarity, practical training, and time to degree. The studies were necessary in part because data on graduate education are notoriously difficult to come by. Until very recently, departments tended not to track their graduate students very assiduously. Departments knew how many students they admitted, and they knew how many they graduated; but they did not have a handle on what happened in between—that is, on where students were in their progress through the program. This was partly because of the pattern of benign neglect that is historically an aspect of the culture of graduate education in the United States, and it was partly because when some students finish in four years and other students in the same program finish in 12 years, there is really no meaningful way to quantify what is going on. “Are you still here?” is a thought that often pops into a professor’s head when she sees a vaguely familiar face in the hall. “Yes, I am still here,” is the usual answer, “and I’m working on that Incomplete for you.” There was also, traditionally, very little hard information about where students went after they graduated. Graduate programs today are increasingly asked to provide reports on job placement—although, for understandable reasons, these reports tend to emit an unnatural glow. An employed graduate, wherever he or she happens to be working, is ipso facto a successfully placed graduate, and, at that moment, departmental attention relaxes. What happens to people after their initial placement is largely a matter of rumor and self-report. English was one of the fields surveyed in the two studies of the Ph.D. It is useful to look at, in part because it is a large field where employment practices have a significance that goes beyond courses for English majors. What the surveys suggest is that if doctoral education in English were a cartoon character, then about 30 years ago, it zoomed straight off a cliff, went into a terrifying fall, grabbed a branch on the way down, and has been clinging to that branch ever since. Things went south very quickly, not gradually, and then they stabilized. Statistically, the state of the discipline has been fairly steady for about 25 years, and the result of this is a kind of normalization of what in any other context would seem to be a plainly inefficient and intolerable process. The profession has just gotten used to a serious imbalance between supply and demand. Up to half of all doctoral students in English drop out before getting their degrees (something that appears to be the case in doctoral education generally), and only about half of the rest end up with the jobs they entered graduate school to get—that is, tenured professorships. Over the three decades since the branch was grabbed, a kind of protective shell has grown up around this process, a culture of “realism,” in which exogenous constraints are internalized, and the very conditions that make doctoral education problematic are turned into elements of that education. Students are told from the very start, almost from the minute they apply to graduate school, that they are effectively entering a lottery. This has to have an effect on professional self-conception. The hinge whereby things swung into their present alignment, the ledge of the cliff, is located somewhere around 1970. That is when a shift in the nature of the Ph.D. occurred. The shift was the consequence of a bad synchronicity, one of those historical pincer effects where one trend intersects with its opposite, when an upward curve meets a downward curve. One arm of the pincer has to do with the increased professionalization of academic work, the conversion of the professoriate into a group of people who were more likely to identify with their disciplines than with their campuses. This had two, contradictory effects on the Ph.D.: it raised and lowered the value of the degree at the same time. The value was raised because when institutions began prizing research above teaching and service, the dissertation changed from a kind of final term paper into the first draft of a scholarly monograph. The dissertation became more difficult to write because more hung on its success, and the increased pressure to produce an ultimately publishable work increased, in turn, the time to achieving a degree. That was a change from the faculty point of view. It enhanced the selectivity of the profession. The change from the institutional point of view, though, had the opposite effect. In order to raise the prominence of research in their institutional profile, schools began adding doctoral programs. Between 1945 and 1975, the number of American undergraduates increased 500 percent, but the number of graduate students increased by nearly 900 percent. On the one hand, a doctorate was harder to get; on the other, it became less valuable because the market began to be flooded with Ph.D.s. This fact registered after 1970, when the rapid expansion of American higher education abruptly slowed to a crawl, depositing on generational shores a huge tenured faculty and too many doctoral programs churning out Ph.D.s. The year 1970 is also the point from which we can trace the decline in the proportion of students majoring in liberal-arts fields, and, within that decline, a proportionally larger decline in undergraduates majoring in the humanities. In 1970-71, English departments awarded 64,342 bachelor’s degrees; that represented 7.6 percent of all bachelor’s degrees, including those awarded in non-liberal-arts fields, such as business. The only liberal-arts category that awarded more degrees than English was history and social science, a category that combines several disciplines. Thirty years later, in 2000-01, the number of bachelor’s degrees awarded in all fields was 50 percent higher than in 1970-71, but the number of degrees in English was down both in absolute numbers—from 64,342 to 51,419—and as a percentage of all bachelor’s degrees, from 7.6 percent to around 4 percent. Fewer students major in English. This means that the demand for English literature specialists has declined. Even if a department requires, say, a course in eighteenth-century literature of its majors, the fact that there are fewer majors means that there is less demand for eighteenth-century specialists. But although the average number of credit hours devoted to courses in English literature has gone down over the last 20 years, the number-one subject, measured by the credit hours that students devote to it, has remained the same. That subject is English composition. Who teaches that? Not, mainly, English Ph.D.s. Mainly, ABDs—graduate students who have completed all but their dissertations. There is a sense in which the system is now designed to produce ABDs. The same trend can be observed in most of the liberal-arts fields. In 1971, 24,801 students received bachelor’s degrees in mathematics and statistics, about 3 percent of all bachelor’s degrees. In 2001, there were 11,171 undergraduate degrees in those fields, less than 1 percent of the total number. Again, it is not that students do not take math; it is that fewer students need specialized courses in mathematics, which are the courses that graduate students are trained to teach. There was a similar fall-off in bachelor’s degrees awarded in the social sciences and history. There was upward movement in only two major liberal-arts areas: psychology and the life sciences. American higher education has been expanding, but the liberal arts part of the system has been shrinking. The Berkeley study, “Ph.D.s—Ten Years Later,” was based on lengthy questionnaires sent to just under 6,000 people, in six fields, who received Ph.D.s between 1982 and 1985. One of those fields was English. People who received their Ph.D.s in English between 1982 and 1985 had a median time to degree of 10 years. A third of them took more than 11 years to finish, and the median age at the time of completion was 35. By 1995, 53 percent of those with Ph.D.s that had been awarded from 10 to 15 years earlier had tenure; another 5 percent were in tenure-track positions. This means that about two-fifths of English Ph.D.s were effectively out of the profession as it is usually understood. (Some of these people were non-tenure-track faculty, and some were educational administrators. Most of the rest worked in what is called BGN—business, government, and NGOs.) Of those who had tenure, less than a fifth had positions in the kind of research universities in which they had been trained—that is, about 5 percent of all English Ph.D.s. Ph.D.s who began in a tenure-track position took an average of 6.1 years to get tenure. Ph.D.s who began in non-tenure track positions but who eventually received tenure, which about half did, took an average of 8.1 years to get tenure. The placement rate for Ph.D.s has fluctuated. Between 1989 and 1996, the number of starting positions advertised in history dropped 11 percent; in art and art history, 26 percent; in foreign languages, 35 percent; and in political science, 37 percent. Yet every year during that period, universities gave out more Ph.D.s than they had the year before. It was plain that the supply curve had completely lost touch with the demand curve in American academic life. That meant if not quite a lost generation of scholars, a lost cohort. This was a period that coincided with attacks on the university for “political correctness,” and it is not a coincidence that many of the most prominent critics of academia were themselves graduate-school dropouts: Dinesh D’Souza, Roger Kimball, Richard Bernstein, David Lehman. Apart from their specific criticisms and their politics, they articulated a mood of disenchantment with the university as a congenial place to work. There were efforts after 1996 to cut down the size of doctoral programs, with apparently some positive effect on the job market. But time-to-degree numbers did not improve. In the sixties, the time-to-degree as a registered student was about 4.5 years in the natural sciences and about six years in the humanities. The current median time to degree in the humanities is nine years. That does not include what is called stop-time, which is when students take a leave or drop out for a semester or longer. And it obviously does not take into account students who never finish. It is not nine years from the receipt of the bachelor’s degree, either; it is nine years as a registered student in a graduate program. The median total time it takes to achieve a degree in the humanities including stop-time is 11.3 years. In the social sciences, it is 10 years, or 7.8 as a registered student. In the natural sciences, time-to-degree as a registered student is just under seven years. If we put all these numbers together, we get the following composite: only about half of the people who enter doctoral programs in English finish them, and only about half of those who finish end up as tenured faculty, the majority of them at institutions that are not research universities. An estimate of the total elapsed time from college graduation to tenure would be somewhere between 15 and 20 years. It is a lengthy apprenticeship. That it takes longer to get a Ph.D. in the humanities than it does in the social or natural sciences (although those fields also have longer times-to-degree than they once did) seems anomalous, since normally a dissertation in the humanities does not require extensive archival, field, or laboratory work. William Bowen and Neil Rudenstine, in their landmark study In Pursuit of the Ph.D., suggested that one reason for this might be that the paradigms for scholarship in the humanities have become less clear. People are uncertain just what research in the humanities is supposed to constitute, and graduate students therefore spend an inordinate amount of time trying to come up with a novel theoretical twist on canonical texts or an unusual contextualization. Inquiry in the humanities has become quite eclectic without becoming contentious. This makes it a challenge for entering scholars to know where to make their mark. The conclusion of the researchers who compiled the statistics on English Ph.D.s for the Berkeley study was, See? It’s not so bad! The reason they give for this is the reason that is often heard when the issues of time-to-degree and job placement are raised, which is that most people who get Ph.D.s, whether they end up teaching or not, report high job satisfaction. (Job satisfaction is actually higher among Ph.D.s with non-academic careers than it is among academics, partly because spousal problems—commuting marriages—are not as great outside academia.) And the majority say that they do not regret the time they spent in graduate school (although they have a lot of complaints about the quality of the mentorship they received). Students continue to check into the doctoral motel, and they don’t seem terribly eager to check out. They like being in a university, and, since there is usually plenty of demand for their quite inexpensive teaching, universities like having them. Business is good. Where is the problem? The effort to reinvent the Ph.D. as a degree qualifying people for non-academic as well as academic employment, to make the degree more practical, was an initiative of the Woodrow Wilson Foundation when it was headed by Robert Weisbuch. These efforts are a worthy form of humanitarianism; but there is no obvious efficiency in requiring people to devote 10 or more years to the mastery of a specialized area of scholarship on the theory that they are developing skills in research, or critical thinking, or communication. Professors are not themselves, for the most part, terribly practical people, and practical skills are not what they are trained to teach. They are trained to teach people to do what they do and to know what they know. Those skills and that knowledge are not self-evidently transferable. The ability to analyze Finnegans Wake does not translate into an ability to analyze a stock offering. If a person wanted to analyze stock offerings, he should not waste his time with Joyce. He should go to business school. Or get a job analyzing stock offerings. It may be that the increased time-to-degree, combined with the weakening job market for liberal arts Ph.D.s, is what is responsible for squeezing the profession into a single ideological box. It takes three years to become a lawyer. It takes four years to become a doctor. But it takes from six to nine years, and sometimes longer, to be eligible to teach college students for a living. Tightening up the oversight on student progress might reduce the time-to-degree by a little, but as long as the requirements remain, as long as students in most fields have general exams, field (or oral) exams, and monograph-length dissertations, it is not easy to see how the reduction will be significant. What is clear is that students who spend eight or nine years in graduate school are being seriously over-trained for the jobs that are available. The argument that they need the training to be qualified to teach undergraduates is belied by the fact that they are already teaching undergraduates. Undergraduate teaching is part of doctoral education; at many institutions, graduate students begin teaching classes the year they arrive. And the idea that the doctoral thesis is a rigorous requirement is belied by the quality of most doctoral theses. If every graduate student were required to publish a single peer-reviewed article instead of writing a thesis, the net result would probably be a plus for scholarship. One pressure on universities to reduce radically the time-to-degree is simple humanitarianism. 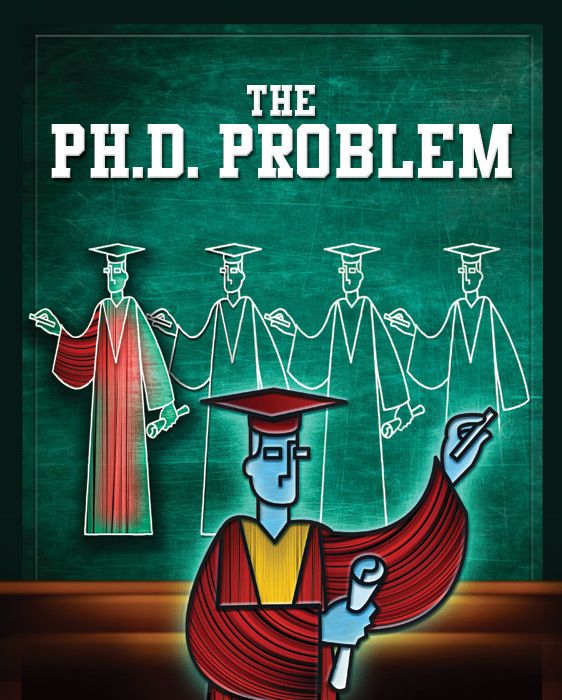 Lives are warped because of the length and uncertainty of the doctoral education process. Many people drop in and drop out and then drop in again; a large proportion of students never finish; and some people have to retool at relatively advanced ages. Put in less personal terms, there is a huge social inefficiency in taking people of high intelligence and devoting resources to training them in programs that half will never complete and for jobs that most will not get. Unfortunately, there is an institutional efficiency, which is that graduate students constitute a cheap labor force. There are not even search costs involved in appointing a graduate student to teach. The system works well from the institutional point of view not when it is producing Ph.D.s, but when it is producing ABDs. It is mainly ABDs who run sections for lecture courses and often offer courses of their own. The longer students remain in graduate school, the more people are available to staff undergraduate classes. Of course, overproduction of Ph.D.s also creates a buyer’s advantage in the market for academic labor. These circumstances explain the graduate-student union movement that has been going on in higher education since the mid 1990s. But the main reason for academics to be concerned about the time it takes to get a degree has to do with the barrier this represents to admission to the profession. The obstacles to entering the academic profession are now so well known that the students who brave them are already self-sorted before they apply to graduate school. A college student who has some interest in further education, but who is unsure whether she wants a career as a professor, is not going to risk investing eight or more years finding out. The result is a narrowing of the intellectual range and diversity of those entering the field, and a widening of the philosophical and attitudinal gap that separates academic from non-academic intellectuals. Students who go to graduate school already talk the talk, and they learn to walk the walk as well. There is less ferment from the bottom than is healthy in a field of intellectual inquiry. Liberalism needs conservatism, and orthodoxy needs heterodoxy, if only in order to keep on its toes. And the obstacles at the other end of the process, the anxieties over placement and tenure, do not encourage iconoclasm either. The academic profession in some areas is not reproducing itself so much as cloning itself. If it were easier and cheaper to get in and out of the doctoral motel, the disciplines would have a chance to get oxygenated by people who are much less invested in their paradigms. And the gap between inside and outside academia, which is partly created by the self-sorting, increases the hostility of the non-academic world toward what goes on in university departments, especially in the humanities. The hostility makes some disciplines less attractive to college students, and the cycle continues. The moral of the story that the numbers tell once seemed straightforward: if there are fewer jobs for people with Ph.D.s, then universities should stop giving so many Ph.D.s—by making it harder to get into a Ph.D. program (reducing the number of entrants) or harder to get through (reducing the number of graduates). But this has not worked. Possibly the story has a different moral, which is that there should be a lot more Ph.D.s, and they should be much easier to get. The non-academic world would be enriched if more people in it had exposure to academic modes of thought, and had thereby acquired a little understanding of the issues that scare terms like “deconstruction” and “postmodernism” are attempts to deal with. And the academic world would be livelier if it conceived of its purpose as something larger and more various than professional reproduction—and also if it had to deal with students who were not so neurotically invested in the academic intellectual status quo. If Ph.D. programs were determinate in length—if getting a Ph.D. were like getting a law degree—then graduate education might acquire additional focus and efficiency. It might also attract more of the many students who, after completing college, yearn for deeper immersion in academic inquiry, but who cannot envision spending six years or more struggling through a graduate program and then finding themselves virtually disqualified for anything but a teaching career that they cannot count on having. My aim has been to throw some light from history on a few problems in contemporary higher education. If there is a conclusion to be drawn from this exercise, it might be that the academic system is a deeply internalized one. The key to reform of almost any kind in higher education lies not in the way that knowledge is produced. It lies in the way that the producers of knowledge are produced. Despite transformational changes in the scale, missions, and constituencies of American higher education, professional reproduction remains almost exactly as it was a hundred years ago. Doctoral education is the horse that the university is riding to the mall. People are taught—more accurately, people are socialized, since the process selects for other attributes in addition to scholarly ability—to become expert in a field of specialized study; and then, at the end of a long, expensive, and highly single-minded process of credentialization, they are asked to perform tasks for which they have had no training whatsoever: to teach their fields to non-specialists, to connect what they teach to issues that students are likely to confront in the world outside the university, to be interdisciplinary, to write for a general audience, to justify their work to people outside their discipline and outside the academy. If we want professors to be better at these things, then we ought to train them differently. Still, as is the case with every potential reform in academic life, there are perils. The world of knowledge production is a marketplace, but it is a very special marketplace, with its own practices, its own values, and its own rules. A lot has changed in higher education in the last 50 years. What has not changed is the delicate and somewhat paradoxical relation in which the university stands to the general culture. It is important for research and teaching to be relevant, for the university to engage with the public culture and to design its investigative paradigms with actual social and cultural life in view. That is, in fact, what most professors try to do—even when they feel inhibited from saying so by the taboo against instrumentalist and presentist talk. Professors teach what they teach because they believe that it makes a difference. To continue to do this, academic inquiry, at least in some fields, may need to become less exclusionary and more holistic. That may be the road down which the debates I have been describing are taking higher education. But at the end of this road there is a danger, which is that the culture of the university will become just an echo of the public culture. That would be a catastrophe. It is the academic’s job in a free society to serve the public culture by asking questions the public doesn’t want to ask, investigating subjects it cannot or will not investigate, and accommodating voices it fails or refuses to accommodate. Academics need to look to the world to see what kind of teaching and research needs to be done, and how they might better train and organize themselves to do it. But they need to ignore the world’s demand that they reproduce its self-image.